And of course a CVS client to download and update the sources. <some_root>\twperl - not yet built. On loading tidyatl/tidy.dsw into MSVC8, and instructing it to 'convert all', I got an error, that tidylib.dsp could not be loaded. The error babbles about the file 'perhaps being corrupted', but it is simply not in the path given in the dsw file. Tidy Property Pages -> Configuration Properties -> MIDL -> General -> Additional Include Directories. Note the use of a relative path, rather than a 'fixed' one ... but it does not make much difference. Due to the changed, tighter, or difference type casting of MSVC8, I had to make some relative minor adjustments to the code. The diff file is given below. As can be seen this is mainly ONLY providing some type casting, and few small fixes for UNICODE. This path I added to Tools -> Options -> Projects and Solutions -> VC++ Directories -> Show directories for: -> Library file. The latest DDK at this time (2007/09/18) appears to be Windows Server 2003 SP1 DDK, which requires the 236MB ISO file be burned onto a CD-ROM for installation. This can be done using ISO Recorder, or BURNCDCC. FAILED. I had added the reference to 'Tidy 1.0' COM component, so why was this an error? Also initially the Browse for HTM/HTML files failed to show the test foo.html file present, but this turned out to be due to the fact that the filter string had been separated with a comma (,) instead of a semi-colon (;). This fixed, and the OpenFile dialogs worked well. I also added an [ Exit ] button, since I do not like to leave people to just jump on the top right big red button to exit an application. And I add some protection from pushing certain buttons when there was say not input file given, and not loading a config file if none was given, but this still left me with a persistent CRASH. I can understand the idea - the function is __cdecl and I called using __stdcall, or vice versa BUT HOW TO FIX THE PROBLEM??? WOWEE, A BREAK ... IS THIS A CLUE, OR WHAT!!! I tried REMOVING the assert, in TWO(2) places in libtidy code ... of course, such 'asserts' only effect the debug version. In most compilers, asserts are 'nothing' in a Release build. 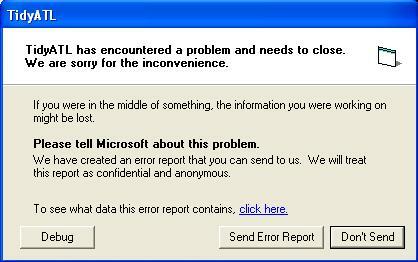 BUT DAGNABIT - I STILL GET THE FIRST ERROR, BUT NOW NOT THE SECOND ERROR DIALOG!?!?!?!? Boy do I HATE it when you make 2 changes, and then it works! You then never know which it was that 'fixed' the problem ;=/. Configuration Properties -> C/C++ -> Advanced -> Calling Convention to __stdcall (/Gz). So it all looks to be there! Why did it not work? As stated above, VB8 wanted this callback function named tdoc_OnMessage1( ... ), and then it all functioned as desired. Although all the initial testing was done with the 'UNICODE Debug' configuration, I eventually got around to building, and testing the other configurations. This required excluding the code in atlimpl.cpp. Most of it had already been excluded if _DEBUG was defined, which is why I chose to initially test with the 'UNICODE Debug' configuration, and it seemed no problem if it was ALL excluded. In fact, after batch build them all, I decided in MSVC8 that 'MinSize' and 'MinDependancy' had little meaning. So I have reduce the MSVC8 solution files to only have four(4) configurations - Release, Debug, UNICODE Release and UNICODE Debug. Feel free to add more if desired. And these are output to the folders Release, Debug, ReleaseU, and DebugU respectively. The final testing was done on the 'UNICODE Release' configuration. While the COM registration is 'automatic', care should be taken when 'playing' with multiple configuration which one has actually been registered. Also both VB8 and C#8 do an extract of the TidyATL.DLL at startup, and write an Interop.TidyATL.DLL into their respective local space. If you make changes, and change configuration, make sure this 'Interop' DLL is deleted each time to ensure you are in fact using the last build. Concerning the 'test' folder, I moved the VB6 test into a folder VB6, and added a VB8 and C#8 folders, containing my two test projects. Just to prove that all problems had been solved I download the 2003 binaries from http://users.rcn.com/creitzel/tidy.html#comatl - From this page I found Tidy.NET.zip, which contained an 'assembly' DLL - Tidy.dll, and the source of a C# TestIt program, and TidyATL.zip, which contained a 2003 TidyATL.DLL, and a VB6 test program, TestTidyCOM.exe, and its source. I had no need for the 'assembly' DLL, and the TestIt C# program was already very similar to that Perry had posted, except it had more output to the console. I had already covered this 'output' by adding an output to a TempLog2.txt file, to be able to examine the results in detail. However the TidyATL.zip, with its 2003 TidyATL.DLL and TestTidyCOM.exe gave me a chance to test and compare. But when I put back my MSVC8 compiled TidyATL.DLL, this addition does not appear. So yes, it seems this problem has been solved by later code Tidy code ... 'funky' character output is SOLVED. Also, when running the 2003 TestTidyCOM.exe I could note that the CALLBACK was working, even with my 2007 TidyATL.DLL. It was this that lead me away from there being a problem with my MSVC8 2007 TidyATL.dll code - that the callback problems must reside in the VB8 program itself. And that led me to using the Visual Basic 'Call Explorer' to discover that the 'callback' had to be named tdoc_OnMessage1(...) ... CALLBACK problem SOLVED. * The C# console application only contains the canned text of the original Feature Request, http://tidy.sf.net/issue/1786061, and thus is VERY LIMITED in scope. But I can NOT see the 'funky characters appended to the text', so maybe this has gone away with this new TidyALT.DLL, built from CVS tidywrap and static libtidy sources of around September 13, 2007. ** WARNING: This is a FROZEN source. It is better that you download the current CVS sources, and use these to build, applying the patches given below. This source also includes the 'test' VB and C# application source, thus duplicating the above 'build set' zips. But there are no binary runtime files. Sources only. StdAfx.cpp - Here I added a #pragma warning(disable:4996) to remove some pesky MSVC8 warnings about 'obsolete' functions. Tidy.cpp - Since I switched the default compile to __stdcall (/Gz) I had to add __cdecl to main() to remove a warning. Tidy.def - Only removed the ordinal numbers, since MSVC8 warned that such ordinal numbers should not be given. Tidy.rc - Since the IDL ouput had changed from TidyATL.IDL to TidyCOM.IDL, then this is reflected in this file. TidyDocument.cpp - This had a number of cast problems, when in UNICODE, converting it to chars to pass to Tidy, and adding a TidyBuffer initialization. tidycom.diff.txt - This is only the commenting out of the two(2) asserts in tidylib.c. As indicated this should not be necessary, and only effects the Debug configuration anyway, since most compiles compile asserts to nothing in Release configuration. atl2diff6.txt - This file contains ALL the changes made to the original CVS tidyatl source - both for the TidyATL.DLL, and for the testTidyCOM Visual Basic test application - to build the sources in MSVC6 and MSVB6 respectively. The DSW/DSP build files reflect my relative folder structure. 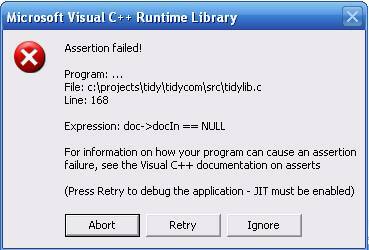 But while I was eventually able to compile a MSVC6 TidyATL.DLL, and install it, testTidyCOM consistently CRASHED! And clicking the enticing [ Yes ] opened MSVC but with a small dialog saying it can not 'run the process' - BAH!